Thanksgiving is over and after all the cooking, that generally means leftovers. I have never been a fan of leftovers, except for one; and that one is my homemade cranberry sauce. I used to buy it in cans until I learned how easy it is to make whole cranberry sauce from scratch. I buy the cranberries when they are on sale. I toss the bag into the freezer. When I am ready to use them, I rinse and cook the cranberries to serve with any type of fowl. In fact, my family thinks cranberry sauce is a necessity whenever I roast a chicken or a turkey -the cranberry sauce and chicken or turkey are a culinary marriage made in a heavenly kitchen. So for me, cranberry sauce is not just for Thanksgiving. How do I prepare the cranberry sauce? I follow the directions on the package except that instead of using all water, as the instructions call for, I substitute orange juice for most of the water and also cut back a bit on the amount of sugar in the recipe. Voila. What could be easier? There are a lot of uses for that leftover cranberry sauce. You can add it to oatmeal. You can use it on pancakes or French toast instead of/ or with a little maple syrup. Use it in plain yogurt or on top of cottage cheese- cranberries make a great fruit salad with peaches etc. and cottage cheese. Use it as a topping for brie cheese. I love turkey or chicken sandwiches (or chicken salad sandwiches) with mayo and cranberry sauce- lettuce and bacon are optional. You can add cranberry sauce to your sweet potatoes, brussel sprouts, spinach or swiss chard with a few toasted pignoli or other nuts. One can make a cheese cake dessert either by using the cranberry sauce as topping on the cheesecake after baking it or swirling it into the cheesecake before baking it. (Pour in half the cheesecake filling and and use 1/2 cup of the leftover cranberry filling by dropping spoonfuls over the batter and swirling gently with a knife. Pour remainder of cheesecake filling on top and using another 1/2 cup of the leftover sauce drop by spoonfuls over the batter and swirl gently with that knife. Bake as you usually would.) Or you can use cranberry sauce to fill a layer cake or use it when baking a coffee cake. There are so many ways to use the leftover cranberry sauce. I would love to learn what TheGardenLady readers do with their leftover cranberry sauce. Cranberries are one of the three fruits native to North Amrica. In fact, the cranberry is said to grow only on the continent of North America. (The other two native fruits are blueberries and Concord grapes.) Native American Indians, the Wampanoag Indians in Cape Cod, the Leni Lenapi Indians of New Jersey, the Algonquins of Wisconsin and the Delaware Indians who used the cranberry as a symbol of peace, introduced the cranberry to the early colonists. 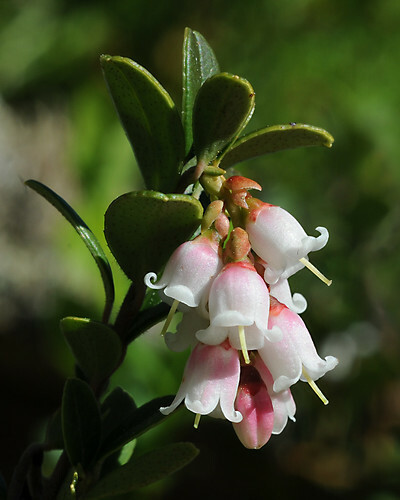 The natives had numerous names for the cranberry, but the name that we use today came from the early German and Dutch settlers who thought the stem and flower resembled the crane- so it was called crane berry which morphed into cranberry. For more history check out this. 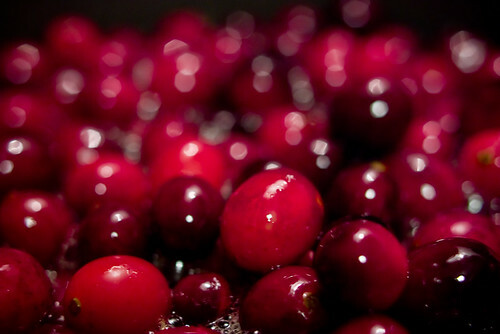 Cranberries are thought to have beneficial properties. See here. Cranberries can be a great addition to your home garden and if you raise these plants, instead of buying the fruit, you can harvest your own. Cranberries are easy to grow and they make a nice ground cover that is considered an evergreen. In the spring the dainty plants have pretty white flowers which nod downwards from their curved stalks and in the summer you start getting small red berries. See here. Cranberries prefer a moderate climate growing well in zones 2 through 6 but can be grown in containers in other areas. They need good drainage, are easy to maintain and need little or no fertilizer. The early part of November is the best time to plant cranberry plants but all fall is good. And if you must plant them in the spring, get them in the ground from April 15th and no later than May 31st. When the fruit ripens you can keep harvesting your crop all through the winter. The commercial growers flood the ground to make it easier for them to harvest the small berries, but that is not necessary for small growers. You can harvest them like the Native Indians- just bend down to pick them. The only thing necessary is that cranberries, like rhododendrons and azaleas, need soil that is very acidic (pH 4 to 5), very high in humus, moist and low in fertility. You can have your soil tested to know how acidic your soil is and to be able to bring it to the desired pH. People add sulfur to the soil to get the desired acidity needed. This is something that you should discuss with your local extension or Master Gardener office to be sure that you are doing it correctly. The way to create these soil conditions is to mix a generous amount of peat moss — a kind of humus low in nutrients — into the soil. You don’t have to work the peat moss deep into the soil because most cranberry roots grow only 6 inches deep. In the fall you can mulch you cranberry plants with sand, pine needles leaves or sawdust to increase the rooting of young plants.